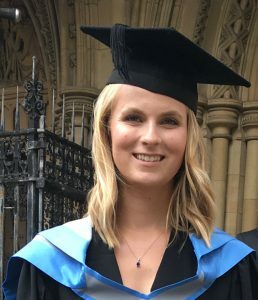 Abbie Banner graduated from the University of Exeter, Penryn Campus, with BSc Zoology in 2018. She is currently GBP Campus Sustainability Project Coordinator (Cornwall). Go Green Week is happening on the Streatham Campus 18th – 22nd March. My role is based in the Environment and Sustainability Institute at the Penryn Campus, and I work with all four institutions on the campus: the University of Exeter, Falmouth University, Falmouth Exeter Plus (shared campus service providers) and the Students’ Union (FXU). I ensure that each of the organisations can support and contribute to making sustainability the norm on campus – this means something different most days. From data handling for creating a ‘sustainability dashboard’ for the campuses, to researching best practice for handling commercial food waste. Along with assisting with restructuring of our campuses’ sustainability governance, to ensuring practices are in line with the University’s biodiversity policy. The summer before beginning University I switched to a plant-based diet. It was my research through this change that opened my eyes to the damage that humans cause to the environment. My personality type is ‘advocate’ which means that I need to feel I’m making a difference to the world, including through my career, so sustainability is the perfect platform for this. Also, being immersed in life by the sea in Cornwall, based on a small, green campus away from the city life I was used to, strengthened my desire to be involved in sustainability within my career. I honestly had almost zero extracurricular commitments for the first couple of years at University. It wasn’t until I gained some confidence at the end of my Second Year, when I became more involved and started to gain some relevant experience. There are so many ways to be involved in sustainability on campus as a student. I dived into the deep end and ran for Environment and Ethics Officer in the Leadership Team of FXU. I was lucky enough to win this student-elected role, which was voluntary and part-time alongside my degree. I also participated in Grand Challenges: Food for Thought as well as the Green Consultants programme. As Environment and Ethics Officer, I presented two ‘motions’ at FXU’s AGM. Both motions voted to pass, which included to ban all plastic straws on campus, and to halve the number of single-use plastic water bottles on campus. Through the Green Consultants programme I had the opportunity to work with Fifteen Cornwall, Jamie Oliver’s restaurant at Watergate Bay with a “positive for the planet” ethos. My team completed a waste audit, analysing 3 years of bills to output infographics and suggested implementations. This felt like my first experience of “real life” work, and a year later I am on the other side Green Consultants acting as the client for several on-campus projects. We lead habitual lives in which it’s easy to make subconscious unethical and unsustainable choices in our daily lives. I hold my hands up and admit that I am not perfect and believe each to their own personal journey towards a more environmentally-friendly lifestyle. I believe there is only going to continue to be a rise in the number of jobs within this sector, with more organisations jumping on the green band-wagon. When my role comes to an end this summer I am eager to go back to the roots of the environmental movement for some time, looking at eco-living, minimalism and incorporating slow-living principles into my lifestyle. Most importantly for me I am looking forwards to spending time with family and friends as well as some travelling before deciding on my next steps.